Journalists, legacy media, digital publishers and platforms, communicators, branded content creators, and social innovators have reinvented the profession by creating and testing new business models as niche and specialized journalism startups. In so doing, they have offered novel news experiences and publishing environments, served underserved communities, empowered contributors to build their own digital brands, offered more relevant content to their communities, and explored new opportunities for audience engagement. They have advanced new storytelling approaches with the help of big data; have integrated immersive virtual reality and Internet of Things (IoT) technology; and have designed journalistic new products and services related to key questions and challenges such as fact checking for non-specialists, filter bubbles, and the impact of personalization of the Internet. While in many European countries legacy newsrooms are still laying off journalists, online publishers and some legacy media companies are revamping for growth and diversifying their strategies by investing in digital startups according to a Financial Times analysis. At the same time, across Europe, journalism startups are creating the first “pockets of innovation” by introducing alternative business models, getting public attention, and raising or crowd-sourcing funds. In Germany, Republik, an open-source cooperative digital magazine to be launched in January 2018, reclaims the role of journalism to reinforce Democracy. Republik co-founder Christof Moser, a journalist and professor, succeeded in raising $2 million. Innovative Journalism Startups from Netherlands are focusing on quality journalism. Blendle employs an “iTunes” model for news. De Correspondent is getting ready for its U.S. presence while more media startups are taking tech press influencer Charmaine Li’s attention: Piano Media in Austria, PressPad in Krakow, Sellfy in Riga/ Latvia, Movellas in Copenhagen and London, Ghost, ShareWall, ReadWave, and Reedsy in London, Liberio in Berlin. In Athens, Press Project  is one of the few independent investigative journalism and data reporting startups that fill the vacuum of failing legacy media. When you look at the global heat maps of the emerging dynamic startup ecosystem, innovation starts to be geographically and culturally diverse and unevenly distributed. We can get an overview and a very informed perspective of the emerging and dynamic startup ecosystems all over the world through the lens of Startup Genome the Global Startup Ecosystem Report 2017. In 2011 a devoted team of researchers, entrepreneurs, and data mavericks launched the Startup Genome project. Inspired and driven by the mission to help building the entrepreneurial ecosystem, they conduct and publish annually primary research with 10,000+ startups and 500 partnering companies to inform local startup leaders about success factors to measure the ecosystem’s lifecycle, to provide in-depth insights by continent or startup city, and to produce a global startup ecosystem ranking. As the CEO of Startup Genome states in their mission statement: Startup founders are driven by their pathos to create a positive change in our world, to participate in a world movement and a revolution in search of innovative solutions, and to experiment with the new business model canvases for making a great idea into an impactful service to people and to their communities. This entrepreneurial ethos is representing a cultural shift about the potential of startup entrepreneurship to bring positive change, to have a desirable impact by the communities, cities, and people in producing solutions. Let’s see the panorama of the top 20 global startup ecosystems to learn more about the cities and continents that are closer to your own interest and entrepreneurial journalism focus. 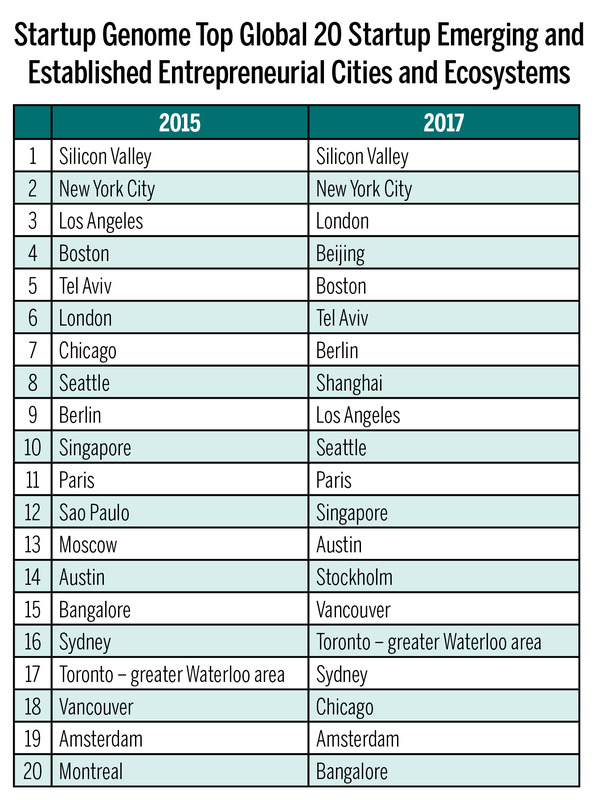 The Startup Genome Top Global 20 Startup Emerging and Established Entrepreneurial Cities and Ecosystems List allows you to compare 2017-2015 rankings for each city. Here’s a snapshot of the 2017 rankings. While Silicon Valley keeps its leadership above any other ecosystem, it is no longer the number one pool of talent, losing its long-uncontested dominance over the Asia-Pacific region and Europe. Government initiatives are playing a significant role in both Singapore and Beijing by creating a friendly entrepreneurial business and cultural environment. African startup cities are on the rise. Even though they have not made it to any of the prominent ranks of the Global Startup Eccosystem report, they are competing for their share in tech, innovation, and sustainable startup solutions. Cape Town in South Africa is the largest startup ecosystem in the continent, which still needs to build up its global networking and connectedness, followed by Johannesburg and Lagos in Nigeria. 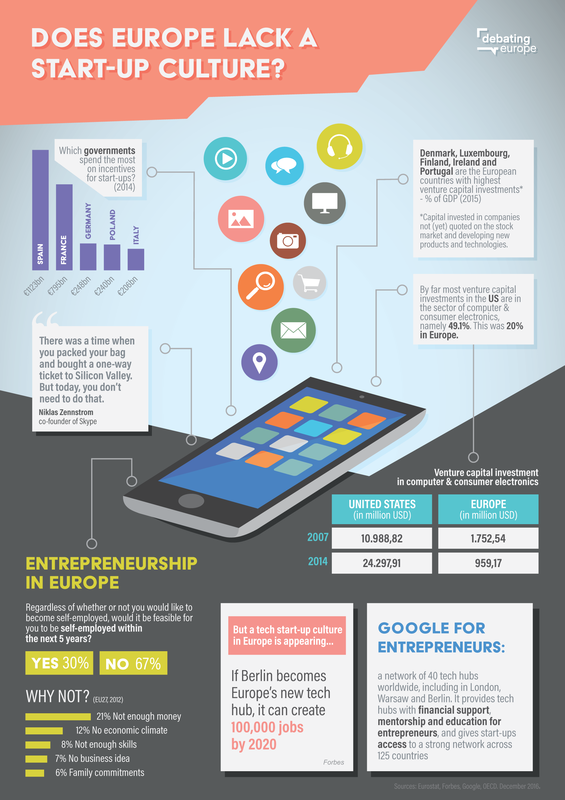 Innovators and Startup Entrepreneurs in Europe: Are They Lagging Behind Silicon Valley? Gleason writes as an insider, who has gained a considerable experience in consulting with U.S. startup entrepreneurs. He asserts that there is an uncontestable structural gap, a disparity, between the two continents when considering their capacity to enable and scale up globally-successful technology-led innovative startups and develop tech giants like Google, Facebook, YouTube, or Apple. He takes the Silicon Valley model (see sidebar) as the benchmark to assess the dynamism and the potential success of entrepreneurial ecosystems that follow a different path of development outside of United States. In 2010, the U.S. enjoyed a “semi-monopoly” position worldwide in generating startup companies. Let’s follow Gleason’s analysis from 2010 about the structural and cultural triggering factors that created this capacity gap for innovation in entrepreneurship between the U.S. and Europe. Location: Europe seems to lack the “hub network effect” of Silicon Valley’s model as an ecosystem attracting innovating entrepreneurs from all over the world, venture funds, and top engineers. Europe has mainly developed “pockets of innovation” in metropolitan cities across the continent. Talent: Silicon Valley’s model as an ecosystem that attracts a diverse pool of talent of innovating entrepreneurs immigrating from all over the world is compared with European mobility of talented and highly skilled people that in the latter case are not translated into a critical mass of successful startups. Market Size: Gaining traction as a startup and making profitable new product launches is considered a safer venture in the U.S. market rather than Europe on the basis of perceived cultural homogeneity (language, culture) and common currency versus a more culturally diverse Europe despite the fact the European overall population is almost double the United States’ size. Support Systems: Compared to the West Coast ecosystem in the U.S., Europe lags in creating access to capital ranging from early-stage funding, seed and angel funds to venture capital funding rounds, along with a supportive business environment offering multiple options for legal and communication advice and professional services along with a pro-entrepreneurship strong media presence. Most notably, compared to the U.S., in Europe there are fewer investors and funding schemes to help tech startups go to market and scale up. Attitude to Risk and the “Fail Fast” Mindset: Risk-taking or risk-aversion is one of the most culturally debated issues in the startup ecosystems and hubs all over the world. The United States fosters a more entrepreneurial mindset, open to more risk, to experimentation, and to “failing fast.” This entrepreneurial mindset becomes a pivotal point in Europe as it attempts to develop global reach and impact. Media: Media and blogs covering technology, entrepreneurship, startup news and innovation topics, founders and funders’ thinking and methodologies have created a new positive and forward-thinking public imagery and culture that encourages new ventures and initiatives. Again, the most influential blogs mentioned such as Mike Arrington, serial entrepreneur and founder of TechCrunch or Jason Calacanis (who defines himself as a serial entrepreneur, angel investor, podcaster, and writer) are featuring the fervent U.S. entrepreneurial scene while Mike Butcher has been one of the more influential voices writing for the TechCrunch European section. Another difference between the European mature ecosystems and Silicon Valley is that that European startups are mainly (55 to 75 percent) B2B oriented while in U.S. the vast majority (two out of three startups) are consumer-oriented businesses. Take smart money only as an investment to scale and expand into your investors’ global networking capacity and/or their ability to successfully address “go-to-market” challenges. Focus hard on gaining market traction through the creation of awareness of key influencers. Locate your business activity or networking in one of the emerging European hotspots. Even with the growth of entrepreneurial ecosystems across the European Union, many entrepreneurs at major tech events such as the Web Summit question whether Europe’s startup culture truly exists. In “Does Europe lack a Startup Culture”?, the authors compare the dollars being transferred in the different markets, however, dollars may not provide a fair comparison. “Debating Europe”,  a bottom-up platform co-initiated by multiple partners to bring together European citizens’ voices directly to European policy makers, published in December 2016 an infographic (see Figure 1) based on data issued by Eurostat, OECD, Google, and Forbes. The graphic provides some insight into this recurring question. To address the funding concern, during Web Summit in 2016, the European Commission announced a “fund of funds” designed to trigger at least €1.6bn in venture capital for startups.” The European Fund for Strategic Investments for small and medium-sized enterprises is one of the many European funding opportunities to mobilize finance in a collective and coordinated way seeking to reverse the low level of investment since the global economic crisis. The European Commission is taking the lead in this global and networked-innovation-driven world where entrepreneurship and innovators address and provide entrepreneurial solutions. These startups are often aligned with the United Nations’ 17 interconnected Sustainable Development Goals (SDGs) to address effectively the challenges they entail “to end poverty, protect the planet and ensure that all people enjoy peace and prosperity.” These goals are at the core of twenty-first-century societies for making positive and impactful change by 2030. The European Commission, by actively contributing and supporting SDGs and the 2030 agenda, strategically positions Europe to pursue a leading role in the new reshuffle of dynamics among global financial and tech robust players. The twenty-first century international consensus advanced also by United Nations (UN) SDGs seems to be that it is all about entrepreneurship and sustainable innovating solutions-makers around the world. A United Nations “Solutions Summit” in 2015 brought together policy makers, innovators, investors in the private sector, and civil society leaders, together with technologists and scientists to partner and co-create impactful “solutions-in-progress.” Entrepreneurs and cross-disciplinary innovators are taking the lead across the world to imagine and develop impactful positive solutions to the biggest global challenges. The EU response has prioritized catalyzing a risk-taking and experimentation culture in Europe by launching the project “FACE Entrepreneurship” and EXCEL, a European Virtual Accelerator to address local limits on access to co-founders, resources, expertise, and markets. One of the key factors in forming successful and sustainable innovation startup ecosystems that will incubate and support world-leading ventures is to establish strong synergies and collaboration between the universities and the innovation startup hubs. Stanford University and its role in building Silicon Valley has been one of the most influential paradigms around the world, a benchmark that inspired both scholarly research and extensive media coverage in the quest of replicating Silicon Valley model in other regions and cities in the world. In Europe, a longstanding barrier to creating continental cities as startup hubs has been the weak or missing collaboration between the academic community and the business-startup ecosystems. The European Commission, by launching the Startup Europe Universities Network, is aiming to connect academic institutions and community to the business and scientific parks setting the framework for enabling collaborative forums, sharing of information and resources, and catalyzing synergies and collaborations. And taking a it step further, Erasmus+ Program provides more funding opportunities to help teachers prepare primary and secondary pupils to be entrepreneurial and creative. The Exchange programs for Young Entrepreneurs nurtures the entrepreneurial mindset at an early age in an attempt to change the cultural paradigm to funding. What might be the impact of combined institutional initiatives taken by the European Commission to “Startup Europe” in creating a more innovation- and startup-friendly environment? Through tax incentives, startup visas, legal context, and advisory services infrastructures built by the European Commission, along with the bottom-up initiatives of the startup ecosystem leaders, entrepreneurs and policy makers hope this European mix will attract more talent, venture funding, and help create global startup brands. The European Startup Initiative takes an active role in facilitating the debate around where Europe’s hottest startup hub is evolving by designing the first data-driven report on startup locations and mobility in Europe as well as a startup heatmap on the perceived quality of the startup hubs in Europe. These cities are emerging as pockets of growth in different European regions, competing for the innovative local and international talent, for digital and mobile creative class, and for investors’ money. A 2016 Venture Beat article makes a good point when it stated that “So While Europe Might be a Single Market, It’s Definitely Not a Single Tech Scene.” This is a challenge for Europe to invent and establish a sustainable innovation and entrepreneurship model. The city of Paris and the French Government, not Berlin, are set to become the beneficiary of any post-Brexit startup fallout, according to some analysts. The government is aiming to make France a “Digital Republic” by supporting digital startups and providing the “French Tech Ticket” to attract international startups. Germany’s capital Berlin has for many years been considered a European mecca for startups. The city has successfully appealed to international professional and artistic creative class talent, converting this success into a booming startup hub. The city is a great example on how to be “inviting” to international talent to relocate, by offering a reasonable cost of living combined with an open culture to learning, to experimentation, to change, to sharing knowledge and to collaboration that can attract and retain diverse entrepreneurial and creative talent. Compare this aspect of Berlin city culture to the rising costs of living in Silicon Valley, where exorbitant housing costs make it inaccessible to new talent, whether international or domestic. Berlin is also investing into lively community meetups that can “help foster individual success.” Government and political support created with a “grassroots inclusive feel” supported by “The German Startup Association–The Voice of Startups in Germany”  make the case for Berlin startup ecosystem. Stockholm in Sweden is a new entrant in the startup cities world, earning a reputation as a “unicorn factory” and in a league of its own with unicorns such as Skype, Minecraft, Klarna, Spotify, and King. And who doesn’t know MySQL, Kazaa, uTorrent, and Piratebay? Looking at the South of Europe, Spain is becoming a considerable leading startup player, with two cities in the forefront. Barcelona and Madrid are both attracting international investment and global digital players like Google and Amazon who are establishing their presence in the innovation-driven cities. Besides the capital cities, we also see vibrant and scalable and high-performing ecosystems growing fast in Lausanne (Switzerland), in Ghent (Belgium), in Krakow (Poland), and in Porto (Portugal). Will these distinct cities-based tech and innovation hubs operate independently or will they become a collaborative network of connected hubs? This is a real bet and challenge for Europe. We will have to see in coming years how these European “pockets of growth” across multiple cities and regions will establish an entrepreneurship model that will fare and compete successfully with the Silicon Valleys or emerging Asian ecosystem(s) as analyzed in Startup Genome Global Startup Ecosystem Report 2017 and the Asia Startup Ecosystem accelerator. If you wish to explore more in depth the commonalities and what differentiates the unicorns from around the world, take 15 minutes to read a very well-documented post on Startup Grind by Alex Stern, published on February 27, 2017 on “Revisiting the Unicorn Club.” In it, he covers all continents, all countries, and sectors. In an attempt to further explore the emerging media innovation hubs around Europe and the corporate actors that take action to enable such an approach, it is worthy to look into The Digital News Initiative Innovation Fund (DNI Fund). The fund is a partnership between Google news publishers in Europe to support high-quality journalism through technology and innovation with the goal to enable and nurture sustainable news ecosystems, collaboration and dialogue between the tech and news industries. Among the founding members are prominent legacy media companies such as The Guardian, The Financial Times, Die Zeit, El País, Les Echos, La Stampa, and organizations such as Global Editors Network, European Journalism Centre, and NRC Group. DNI Fund was launched in 2015 andhas invested more than €70m to more than 350 projects in 29 European countries. DNI seems to have a quite balanced distribution of its fund among the participating countries. As an indication, here are the number of funded projects by country: Austria (9), Belgium (10), Czech Republic (7), Denmark (6), Finland (9), France (9), Germany (9), Greece (7), Sweden (9), Switzerland (9), and the United Kingdom (9). The DNI Fund Projects offer innovative journalism and media entrepreneurial solutions to a wide spectrum of media-related challenges. In Austria, De-Escalation Bot is figuring out how to de-escalate negative emotions online. In Belgium, Wave offers interest-based listening experiences through connected cars, virtual assistants, and other smart technology devices. Likewise, in Greece, the Connected Cars, Connected Audience, News Ecosystem Project is a prototype developed at Aristotle University. It’s investigating the ways connected and self-driving cars will impact news organizations. In Switzerland, NZZ Companion App will provide personalized, geotargeted, niche news based on a user’s preferences. In the Czech Republic, Mural makes visual storytelling easier for online journalists. In Denmark, PoliWatchBot helps citizens better understanding their political process through public data. In Germany, Tagesspiegel Causa is a website for debates. In Finland, Woodpecker Findings employs gamification to serve millennials. And there are others. You can tour more DNI FUND projects at https://digitalnewsinitiative.com/dni-projects/ (filter by country and then DNI Fund Projects). One key lesson for building successful entrepreneurial ecosystems both from Silicon Valley as well as from the European Commission strategy is to actively involve the academic, scientific, and research communities as co-creators and enablers. This is the path that many leading academic institutions in the U.S. have followed very actively over the last ten years by introducing entrepreneurial journalism and media innovation programs into their journalism, media, and communication programs to help students as well as to train professionals in entrepreneurial thinking, skills, tools, and methodologies…and to innovate. Initiatives to introduce media entrepreneurship compared to those in U.S. are modest. The journalistic traditions in Europe that separate journalism production from the business and market side of media companies are still strong in many countries. European academics are still skeptical of the new “hybrid” and porous concept of bringing both editorial and financial sides together into collaborating and re-defining the purpose and the impact of journalism. In 2012, the entrepreneurial journalism U.S. educational model found its first early advocates in Britain and Baltic countries’ universities. Entrepreneurial journalism courses are offered as part of journalism academic programs or professional training initiatives in France, Germany, Switzerland, and the Ukraine. In response to this request, Pierre France, Quora community member, posts a document with a list of entrepreneurial journalism courses offered in their U.S. Universities, with a few in Europe, in Canada, and in Mexico (list updated 21 July 2014). Athens, Greece, even though is not featured in any of the top startup cities rankings, has gained publicity for succeeding in building a vibrant startup culture and ecosystem in a crisis-ridden economy that has been retracting since 2010, despite a long period of political and financial uncertainty and the unemployment rate climbing around 25%. The last ten years, Athens has enjoyed the bottom-up birth, growth, and impact of enabling disruptive change and innovation out of the vision and the passion of a very small group of techies and bloggers, who are well connected locally and internationally with pioneering tech communities. Create a network of people with common interests to support relationship building and collaboration. Cultivate a culture of innovation and entrepreneurship. Spread new technologies with an emphasis on the web. These pioneers followed closely the three waves of the Internet revolution and the emerging startup movement and were familiar with the global debates and developments, particularly in Silicon Valley. They became the first ambassadors for disruptive startup innovation during the second wave of the app economy and mobile revolution (2010-2015) building their own startups. They purposefully collaborated, in a non-collaboration-friendly culture, to building a very active Athens startup ecosystem. They worked to connect the hubs of innovation and they launched the first funding schemes (Open Fund, Marathon VC) and tools to enable the first promising local founders with the potential to scale their businesses internationally. They invested in building trust and social proof (a psychological principle marketers use to build trust around brands and products) as the most important currency for impact and success. Within a turbulent political and social landscape and an anti-entrepreneurial mindset prevailing for decades in both the political class and the society at large, Athens startup founders created a strong case of disruptive and impactful innovation where they were able to reverse the current attitudes and trigger a “startup fever” among youth, business, and institutions, followed by the reluctant political class. Startup incubators, co-working spaces and innovation labs, Startup Weekend events, and hackathons were initiated by startup founders, social entrepreneurs, foundations, philanthropic and cultural institutions, NGOs, museums, embassies (the U.S. Embassy and the Embassy of Netherland being among the most active ones), business associations, international initiatives, digital leading companies such as Google or Microsoft, and companies that invested in empowering young startup entrepreneurship as part of their sustainability policies to spark innovation in their own sectors and supply chains. The majority of Greek startups are aiming to serve international markets and customers. The local market is very small to sustain a viable startup venture that scales up internationally and has a successful exit. In 2013 TechCrunch Europe and its editor, Mike Butcher, held their second meetup in Athens, showcasing how the Greek startup community could break the local financial and cultural boundaries and enable some international players. In the World Bank high-ease-of-doing-business ranking for 2017 indicating if the “regulatory environment is more conducive to the starting and operation of a local firm,” Greece is ranked in the 56th position for starting a new business and fell to 61st for the ease of doing business. In this unfriendly regulatory environment, international media positive coverage of the successful Greek startups with the potential to turn Greece into a startup hub has been juxtaposed against the counternarrative of all the financial and political coverage about the prospects of the never-ending crisis-torn country. “It’s been easy to overlook Greece’s tech scene since the country’s recent economic woes eclipsed most of the other news,” wrote Itai Elizur in The Next Web. “The debt crisis sent most businesses reeling, and, despite declared over in 2015, its negative effects still linger today. The rest of Europe still keeps a close eye on the government’s management of the economy and unemployment still is at 23.6 percent in Q4 of 2016. “Could the Greek tech sector save the Greek economy?” asks Cate Lawrence, a contributing writer at Readwrite. How did we reach this high point of expectations of the Greek startup innovators to make such change ,and impact in a country plagued by one of the worst financial and social crises in her recent history? With an educated and innovative workforce, and great traction with angel investors through structures like EVEA Business Angels Network, Angels Group by StartTech Ventures Incubation Fund, and more recently by Marathon VC, it’s clear that Greece’s startup sector is healthy. With its reputation growing, we soon might see entrepreneurs emigrating to Greece to join the burgeoning tech scene. As a first evidence-based estimation of the size and investments in the Greek startup technology market for the period between 2010-2016, Marathon VC conducted a short study researching available data from public and private sources to track the dynamic and potential of the market. In 2015, I introduced a graduate course on Entrepreneurial Journalism in a newly launched program on Journalism and New Media at my home institution Panteion University. The curriculum change developed as a result of my participation on the Study of U.S. Institutes on Journalism and Media at Ohio University the same year, which focused my personal research project on developing a curriculum in the field after studying, benchmarking, and creatively adapting the best U.S. academic and training practices in this innovative field in my local academic and professional journalism context. In 2016, with the support of U.S. Embassy Athens and in collaboration with the Tow-Knight Center for Entrepreneurial Journalism, we organized the first Athens “Startup Weekend on Entrepreneurial Journalism” as a community outreach activity. We invited mid-career journalists in legacy media and online publishers, communications professionals who are experimenting with introducing intrapreneurial-branded journalism, and native advertising projects as well as university students. Value creation and the quest to make a positive change by engaging students, the startup ecosystem, legacy media, and online media into collaborating to imagine and design innovative journalism startups, proved a stronger transformative experience to overcome long-standing suspicious attitudes to entrepreneurship and to empower people to start their own journalism independent or intrapreneurial projects. The co-creation educational and learning model of inviting key stakeholders from the local and international ecosystems to contribute as mentors at the core of the program is creating an “accelerator effect” and a fertile environment where all partners and participants are sharing and testing new ideas. Local market conditions and academic cultures, despite harsh critics, have been proved to be more fluid and adaptive in embracing a bold entrepreneurial mindset and course of action as the way out of current financial crisis as well as the path for bold https://www.youtube.com/watch?v=65NgOzCk1aA exponential growth and innovation. Organize an international meetup for young journalism entrepreneurs and make an impact in your community. Consult an easy-to-read Mashable article to guide you step-by-step on how to organize a Successful Meetup”. Create a meetup now and get into action! Is Silicon Valley or should it be a replicable model for developing successful innovation and startup ecosystems around the world? Discuss how a model of “pockets of innovation” like the one we explore in Europe can provide an alternative “connecting the hubs” approach for scalable innovation. Why might mobility and diversity of talent in the U.S. and Europe have had different impact on developing and scaling up comparable numbers of successful startups? Building on the previous question: What other factors might be critical to help the talent and innovation pools around the world to make their mark? Consider booming innovation and startup ecosystems also in Africa, Asia, and Latin America. Discuss the assumption that U.S. market and society is more homogeneous in terms of culture and subsequently, is more attractive and promising for new ventures and investments. Imagine what does not yet exist by working as a team on “What If” questions about the possible futures for media innovation hubs across different cities and regions of the world. Choose a city/region of the world where you want to launch a scalable journalism startup. Organize a discussion and reach an informed decision with your team, all simulating the roles of journalism startup co-founders. In this project, you will scale up internationally a journalism startup that taps into the opportunities of the third wave of the Internet revolution (Internet of Everything) with your base in a major city in Europe, Asia, Africa, or Latin America. Decide on the city and continent where you will launch your journalism startup, based on what will best enable you to scale up internationally. Discuss and evaluate global startup ecosystems and markets. Meet and consult with startup ecosystem experts in journalism innovation to get market and investment insights. Create alternative options and scenarios based on your assessment of opportunities and risks for each ecosystem. Briggs, Mark. “What Makes a Successful News Startup?” The Quill 99, no. 6 (2011): 27-30. “Britain Needs Scale-up Businesses as Well as Start Ups.” Business Review Europe, 2015, Business Review Europe, Nov 26, 2015. Chimbel, Aaron. “Introduce Entrepreneurship Concepts Early in Journalism Curriculum.” Newspaper Research Journal 37, no. 4 (2016): 339-43. CIOL Writers. “Berlin May Replace London as the Startup Capital of EU after Brexit,” CIOL, June 25, 2016. “Commission Gives Boost to Startups in Europe.” European Union News, November 23, 2016. Dvorkin, Lewis. “Inviting the Rise of the Entrepreneurial Journalist: True/Slant Is Modeling the Newsroom of the Future by Empowering Contributors to Build Their Own Digital Brands — and by Changing the Role of the Editor.” (Building Community: Journalists’ New Journey)(Viewpoint Essay).” Nieman Reports 63, no. 3 (2009): 22. Estrin, Saul, Mickiewicz, Tomasz, and Stephan, Ute. “Entrepreneurship, Social Capital, and Institutions: Social and Commercial Entrepreneurship across Nations. (Statistical Data)(Abstract).” Entrepreneurship: Theory and Practice 37, no. 3 (2013): 479. Fullerton, Romayne Smith. “It’s Time to Find a New Business Model … Because without Journalism, Our Democratic System Will Fail.” Media (Canadian Association of Journalists) 17, no. 6 (2016): 8-11. “Germany: EU Monitor: Startups and Their Financing in Europe.” Mena Report, September 30, 2016. Grant, Adam. Originals. How Nonconformists Move the World. Penguin Books. Reprint Edition. 2017. Hunter, Anna, and Nel, Francois P. “Equipping the Entrepreneurial Journalist: An Exercise in Creative Enterprise.” Journalism and Mass Communication Educator 66, no. 1 (2011): 10-24. Johnson, Steven. Where Good Ideas Come From.The Natural History of Innovation. Riverhead Books, 2011. Kelly, Kevin. The Inevitable. Understanding the 12 Technological Forces that will Shape our Future. Penguin Books. Reprint Edition, 2017. Maisonnave, Fabiano. “Covering the Waterfront: Despite a Fraught Political and Economic Environment, Entrepreneurial Brazilian Journalists Are Striving to Revitalize Coverage.” Nieman Reports 70, no. 1 (2016): 14. McAfee, Andrew, and Erik, Brynjolfsson. Machine, Platform, Crowd: Harnessing our Digital Future. W.W. Norton & Company, 2017. Sarasvathy, Saras D., and Venkataraman, Sankaran. “Entrepreneurship as Method: Open Questions for an Entrepreneurial Future.” Entrepreneurship: Theory and Practice 35, no. 1 (2011): 113. “Tech Trailblazers Tech Startup Index Highlights Social Media and Promotional Divide between Europe and US Startup Culture.” M2 Communications, July 09, 2014. Vega, Tanzina. “New Journalism Degree To Emphasize startups.” New York Times (1923-Current File) (New York, N.Y.), September 20, 2010. Betty Tsakarestou, Ph.D., is assistant professor and head of the advertising and public relations lab at Panteion University, in Athens, Greece. She is co-initiator of Connecting Cities, an exchange scholar of Study of U.S. Institutes (SUSI) on Journalism and Media at Ohio University (2015), branding officer and European co-liaison of the International Communication Division of The Association for Education in Journalism and Mass Communication (AEJMC) and a Startup Weekend on Entrepreneurial Journalism organizer. Reach her on Twitter at @tsakarestou. Media Innovation and Entrepreneurship by Betty Tsakarestou is licensed under a Creative Commons Attribution 4.0 International License, except where otherwise noted.